Simulation of a mixer equipped with three impellers. The velocity profile is shown using streamlines, arrows, and slice plots. Continuous stirred tank reactors, batch reactors, and mixers are frequently used in the consumer product, food, pharmaceutical, and fine chemical industries. Processes using these devices usually require carefully controlled environments, where conditions such as temperature and composition are regulated to ensure quality and reproducibility. 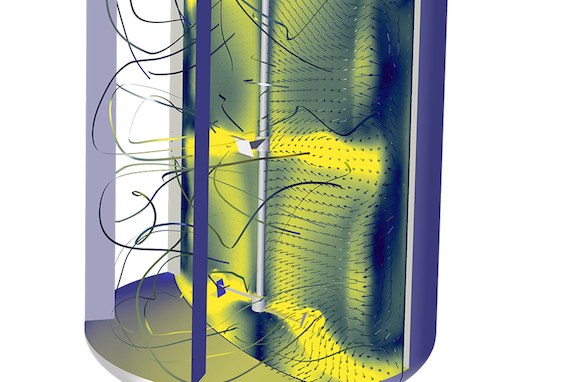 This webinar will demonstrate the use of simulation in the COMSOL Multiphysics® software to understand, predict, and validate the design and operation of mixers and nonideal reactors. The presentation will include a live demonstration and Q&A session. Valerio Marra is the marketing director at COMSOL in Burlington, MA. Previous roles include working in applications, technical support, and sales.